Here's our festival guide for the politically-inclined. Over the weekend of May 18–21, Flying Lotus, Princess Nokia, and Mykki Blanco, along with the other breakout musicians in Moogfest's all-star lineup, will draw festival-goers the world over to downtown Durham, North Carolina. But the music is only half the story. The festival, which celebrates Robert Moog's legacy of experimentation in creativity and technology, will continue its long-standing tradition of day-time programming, offering up workshops, panels, and activities for experts and enthusiasts alike to contemplate the future of music, art, and technology. For the second year in a row, NEW INC will be featured prominently. Members affiliated with NEW INC are scheduled to hold six programs in total—the crux of which consider the opportunities and dilemmas that advancements in technology are expected to present in the years to come. For some, like artist Stephanie Dinkins and design collective Public Science Agency, the workshops question the feasibility of utopia, as well as the existing standards used to measure it; others, meanwhile, like artist Taeyoon Choi and the team behind The Argus Project, anticipate and prepare for bleaker, dystopian futures. "There’s something inherently political about discussions regarding how the future will be shaped by technology," Emmy Parker, Moogfest's creative director, told NEW INC in an email. "[H]ow the future develops depends on the decisions we make today...We have the power and the responsibility to determine if the technology we create is used to bring about a more equitable future or not." NEW INC's involvement in Moogfest this May comes on the heels of its recent "Create and Advocate" venture, in which the incubator paired New York-based social justice organizations with artists and technologists at A/D/O's space in Brooklyn. "Protest is about giving a voice to the unheard," Parker said about the festival's Protest theme, one of ten others crafted in accordance with Moogfest's mission. "Protest is a wake-up call to engage each other with compassion, and to critically consider our way of life and what we create. We hope that people will come away from Moogfest inspired and empowered to use all the tools at their fingertips to design unique solutions that create a beautiful future for everyone." Read on to see the full list of events at Moogfest hosted by NEW INC members. You can also explore the festival's full program schedule here. Workshop Description: Hand­written signs are personal, compelling inter­faces between people and the city. A sign can also be a device for inter­vening into public space, or a tool for intro­ducing counter-narra­tives to the main­stream media. If we consider protest signs as a poetic medium for social engage­ment, a sign making workshop is a space to develop your message by learning from people whose views and prior­i­ties may differ. In this workshop we will reflect on protest signage we’ve seen recently, and talk about different ways to create a simple and compelling message by asking the following: How do we make signs that start a dialogue instead of shouting messages in one direction? What are effec­tive strate­gies for commu­ni­cating complex messages and emotions concisely? Where does public demon­stra­tion have value as a polit­ical and perfor­ma­tive act? How can we bring artistic practice closer to activist praxis? Related: Op-Ed: What Can We Learn From Alternative Art Schools? Workshop Description: How long does it take to build utopia? Together as a group, we will find out. In this workshop, we will try to build a simulated utopia that all participants are happy with. We will introduce concepts in systems thinking, computer simulations, and participatory design. Participants will learn how to represent real world interconnections and dynamics with numbers and algorithms. Design the world, and see how it evolves according to the group’s decisions. This simulation of consensus and community building requires no prior coding experience. Panel Description: We live in a time when the stuff of science fiction from generations past comprises our lived reality. How these scientific and technological breakthroughs shape our present society–and how today’s rapidly developing innovations will shape the society of tomorrow–provides endless material for contemporary artists and creative practitioners to investigate and explore. This panel discussion brings together artists, designers, technologists and activists from NEW INC, the New Museum's incubator for art, design and technology. The discussion will attempt to surface the inherent assumptions, choices, implicit biases, and ideals in their work. Workshop Description: Artificially intelligent systems (AI) are increasingly the ubiquitous, unseen arbiters of our social, civic, and family lives. Ever-increasing computational power, combined with almost limitless data, has led to a turning point in the way AI assists, judges and cares for humans. The need to understand how, where, and why bias enters human-robot interactions, is more important than ever. This workshop will use a hands-on approach to exploring the deepening relationship between humans and their AI. We will work in groups to identify critical social, and ethical implications of human and robot interaction, and use IBM Watson to create chatbots that are trained by, and aligned with, the ideals of the workshop community. Workshop Description: What if we hand make our computers? This workshop will introduce the fundamentals of computation and electronics. Participants will learn to use breadboard, switch, LED and NAND (which is short for not AND logic) Integrated Circuit chips. By combining NAND gates in various arrangements we will make every possible binary logic pattern. Using the logic, we will make Half-Adder which has an arithmetic function that performs Boolean algebra, SR Latch which has a memory function that stores data and an oscillator with a clock function that keeps track of time and synchronizes the computer’s various operations. This workshop is geared for someone without prior experience and knowledge about electronics as well as experienced hackers. 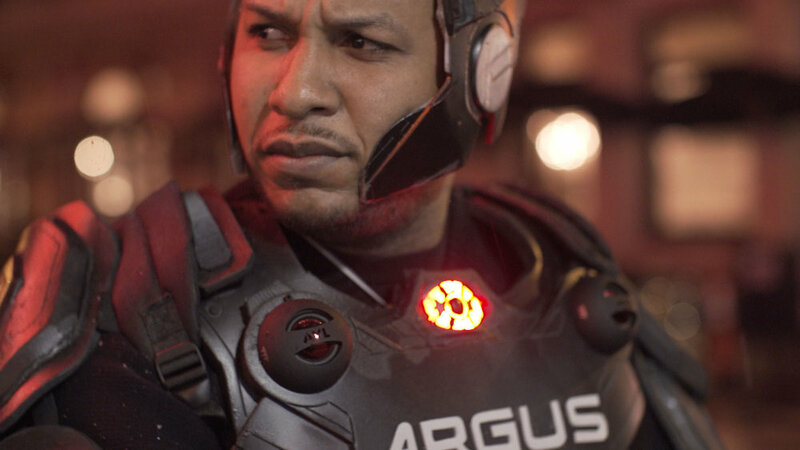 The Argus Project is a technological intervention that meets the issue of police violence head on by asking a question: " "If police wear body armor in to protect themselves while in public, what must The Public wear to protect themselves from police?". To answer, we have designed a protective full body exo-suit for activists and other targetted inviduals loaded with video cameras and other sensors to monitor police behavior, creating a 'forcefield of accountability' around the body of the wearer. Moogfest 2017 will be held in downtown Durham, North Carolina from May 18–21.